"Darkly hilarious...an unexpected bundle of joy." Alice Cohen was happy for the first time in years. After a difficult divorce, she had a new love in her life, she was rais­ing a beloved adopted daughter, and her career was blossoming. Then she started experiencing mysterious symptoms. After months of tests, x-rays, and inconclusive diagnoses, Alice underwent a CAT scan that revealed the truth: she was six months pregnant. At age forty-four, with no prenatal care and no insurance coverage for a high-risk pregnancy, Alice was besieged by opinions from doctors and friends about what was ethical, what was loving, what was right. With the intimacy of a diary and the suspense of a thriller, What I Thought I Knew is a ruefully funny, wickedly candid tale; a story of hope and renewal that turns all of the "knowns" upside down. 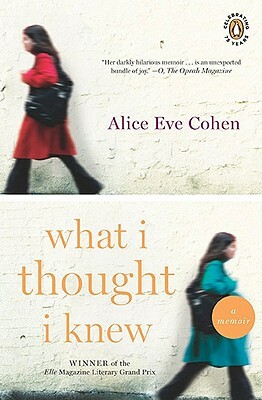 Alice Eve Cohen is a playwright, solo theater artist, and memoirist. She has written for Nickelodeon and PBS and received fellowships and grants from the New York State Council on the Arts and the National Endowment for the Arts. She teaches at The New School in New York City.